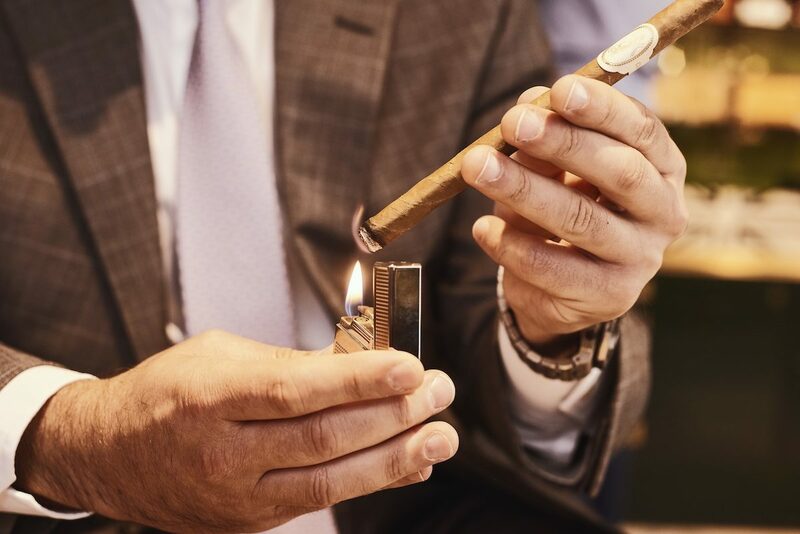 The Rake’s cigar expert, Mike Choi, dispenses some words of wisdom in how to light your cigar and most importantly how not to, in other words, with a £50 note. Eddie Sahakian, proprietor of Davidoff of London, lights his Davidoff 3000 slim guage panatella. Photo by Kim Lang. It might seem like a straightforward action to carry out, but with a cigar, there are certain rituals to abide by. This shouldn't come as a surprise, because for something so delicate, so precious and so flavoursome and intense, patience and accordance to the rules is absolutely necessary, as a cigar deserves respect. Just reflect on the love and care that each cigar goes through, particularly in the hand-rolling process, they're cylindrical works of art and architecture, and when ignited give you a sense of pleasure that words struggle to define. You are the end consumer, and the manufacturer is well-aware of that and they never want to disappoint. 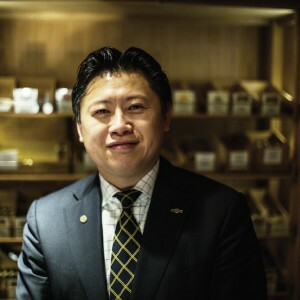 Here, Mike Choi, one of the most respected voices in the industry, will guide you in how to light your cigar. I don’t recommend using your average Swan Vestas safety match but, a match designed for cigars which is longer, made out of cedar wood and has a strike head that has a lower sulphur content. The last thing you want when you draw on your cigar is the taste of sulphur! When you strike a cigar match, hold it away from the cigar. You’ll get a puff of sulphur as it ignites and you want to keep that away from your cigar. This only takes a couple of seconds. Matches are a classic way to light a cigar but, it can take longer and if you don’t watch what you’re doing, it’s very easy to scorch the wrapper of the cigar. As a cigar sommelier, I would light cigars for guests by holding it by the band in my left hand and then the lit match in my right. A quicker way to use the match to the light the cigar is to cut the cigar and put it in your mouth. Light the match and then hold it close to the foot of the cigar, rotate the cigar with the other hand and draw. You will see the flame jump to the foot of the cigar. A couple of draws whilst rotating will get the cigar going. Take the cigar out of your mouth and turn it around and look at the foot, it should be red all over. Any dark spots on the foot would show you where it needs touching up with another match. Smaller dark spots could be fixed by taking a couple of quick draws on the cigar, turn the cigar around and blow on the foot. Cedar wood is one of cigar’s best friends. It is used to make cigar boxes, dividers, the inserts in tubes and in humidors, as well as being an aid to maintain humidity. It also helps perfume cigars as they will absorb the aroma of the cedar wood over time. When you open up most boxes of cigars, you will find a cover sheet of cedarwood and then another that divides the two layers of cigars. These thin pieces of cedar wood can be cut or torn to make cedar wood spills. They literally cost nothing as you get them included in your box. For a more professional look, a friend in America makes custom made cedar wood strips. I met Thomas Person a couple of years ago in London. I was surprised at how much research and testing went in to finding the right type of cedar wood. With the aid of a laser, Thomas can produce just about any logo or name on his spills. A soft yellow flame lighter takes time to light a cigar but, it doesn’t scorch the foot of the cigar like a jet lighter as the flame is cooler and it can reduce the initial bitterness in the smoke. Using matches, cedar wood spill and soft flames are all better options for lighting a cigar. These use odourless butane gas. The biggest downside is that they are difficult to use outdoors. I see this one as a hybrid lighter. The technology has been around for a while but my friend Justin Seldis, took it a step further. The Cigar Traveller is designed to be a way of taking a lighter onboard a plane in your carry on luggage with the power of a jet but allowed by customs. This is by done by having a Bic style insert which is rendered useless as it has no flint wheel. The clever stuff is in the body of the Cigar Traveller. It converts a soft flame lighter into a jet lighter. Travel with them separately. High pressure butane gas lighters, generically called jet lighters (another name is wind proof) are very common. They are much quicker to use and are suited for use outdoors. My go to jet flame lighter is a S.T. Dupont Defi Extreme. I’ve had this for 5 years at least and it’s still going strong. It’s a rugged shape single flame lighter and has a decent sized reservoir for butane gas. It’s design reminds me of a Lamborghini for some reason. It is actually the most expensive accessory I use on a regular basis. Multi-flame lighters are also available, up to 5 flames. These are good if you smoke large ring gauge cigars but, if used on smaller gauge cigars, scorching the wrapper is very easy. Due to the number of flames, they consume butane gas quicker. • £50 note - don’t waste money!